Joseph Bumby, Sr. came from Great Britain in 1873. He started selling hay, grain and fertilizer from a warehouse on Church Street. When the railroad arrived in 1880 his warehouse was used as the depot and he was the ticket agent. 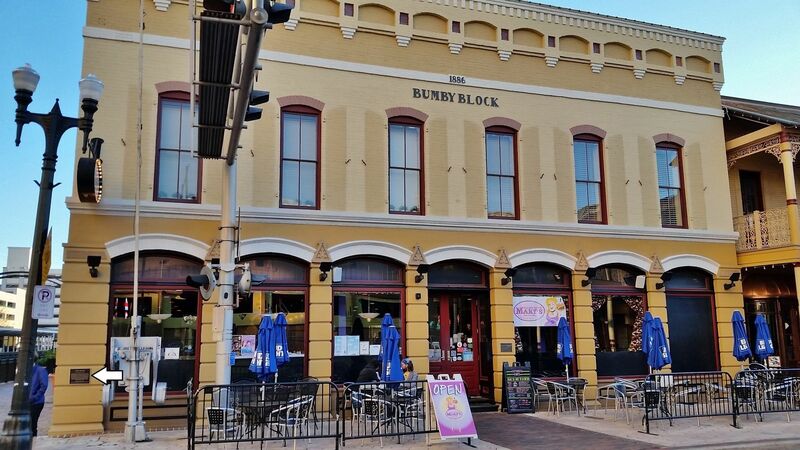 In 1886, Bumby completed this structure and started a successful hardware business. 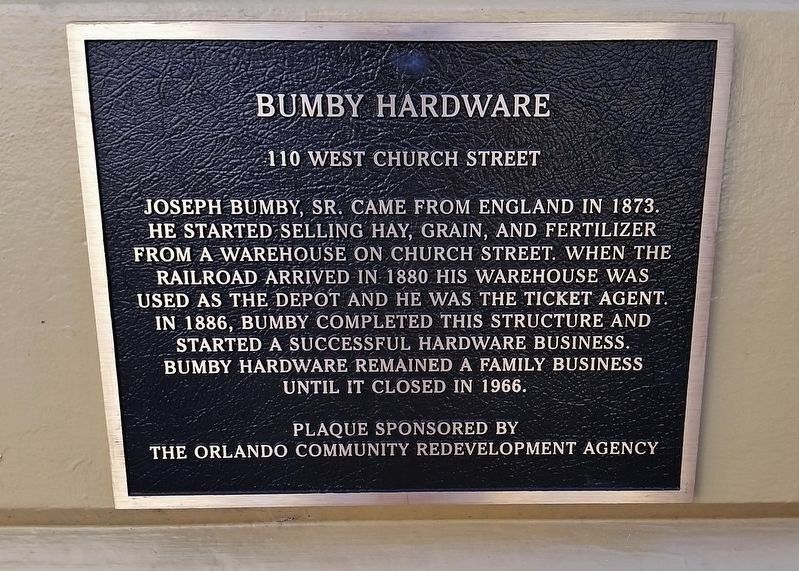 Bumby Hardware remained a family business until it closed in 1966. Erected by The Orlando Community Redevelopment Agency. Location. 28° 32.413′ N, 81° 22.854′ W. Marker is in Orlando, Florida, in Orange County. Marker is at the intersection of West Church Street and Gertrude's Walk, on the right when traveling east on West Church Street. Touch for map. Marker is mounted at eye-level, directly on the northeast corner of the subject building, facing West Church Street. 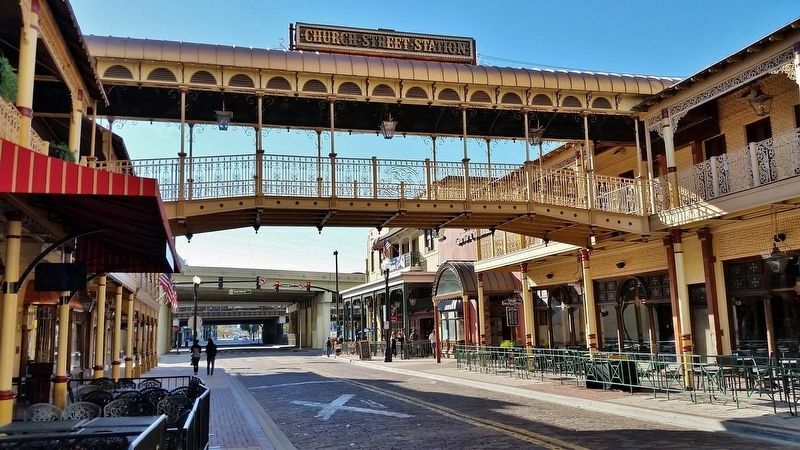 Marker is at or near this postal address: 110 West Church Street, Orlando FL 32801, United States of America. Touch for directions. (approx. 0.4 miles away); Linton E. Allen Memorial Fountain (approx. half a mile away); Mount Pleasant Baptist Church (approx. half a mile away); Mathew Robinson Marks (approx. half a mile away); Orlando Reeves (approx. 0.7 miles away); "Lest We Forget" (approx. 0.7 miles away); John R. Mott House Site (approx. 0.7 miles away). Touch for a list and map of all markers in Orlando. Regarding Bumby Hardware. 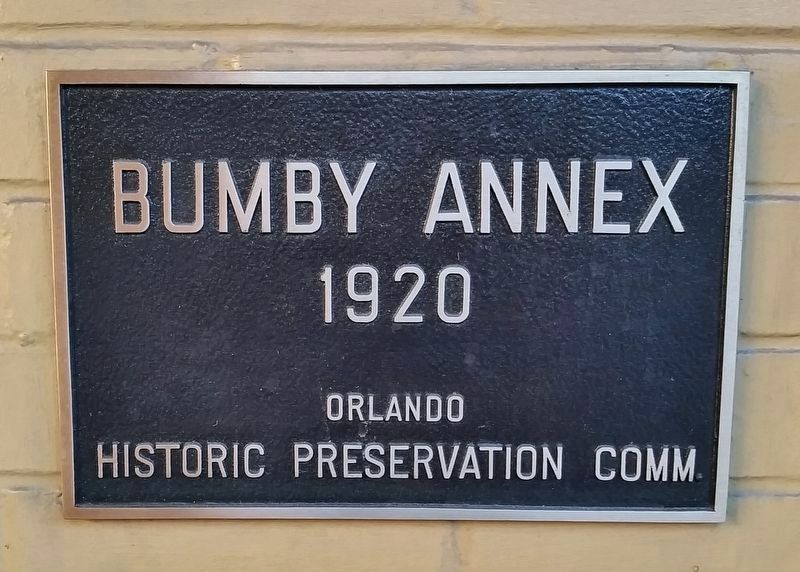 The Bumby Building was designated an Orlando Historic Landmark in 1978. More. 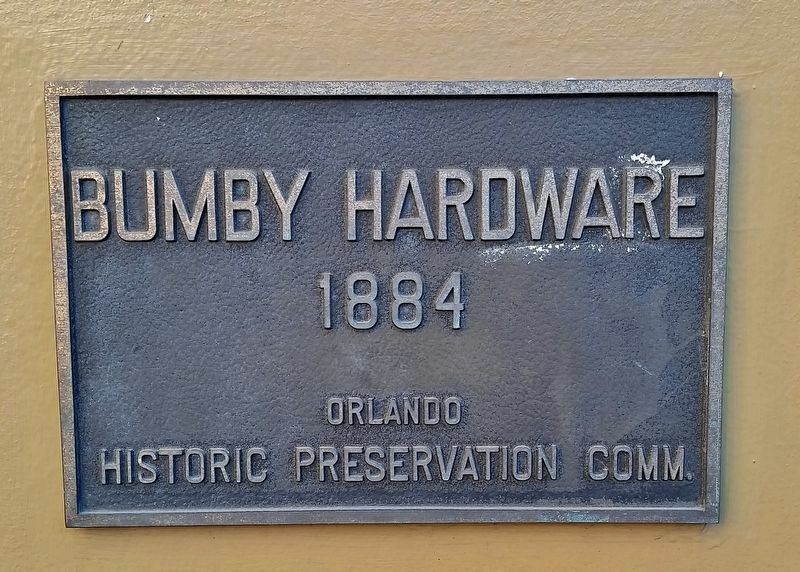 Search the internet for Bumby Hardware. Credits. This page was last revised on April 15, 2019. This page originally submitted on April 13, 2019, by Cosmos Mariner of Cape Canaveral, Florida. This page has been viewed 31 times since then. Photos: 1, 2, 3, 4, 5. submitted on April 15, 2019, by Cosmos Mariner of Cape Canaveral, Florida.